Jesus is the subject, no doubt about it. The life of our Lord and Savior Jesus Christ—from birth, to death, to resurrection—is one we exalt from Sunday to Sunday, Christmas to Easter, and throughout the year. It’s no wonder that Church of God congregations across the country and around the world are pulling out all the stops for a week of worship, reflection, outreach, community service, and celebration. Throughout the movement, churches are preparing for community Easter egg hunts and festivals, Communion, Good Friday gatherings, Sunrise services, breakfasts and brunches, stations of the cross, special music and drama—and of course, footwashing. Faith Community Church in Shawnee, Oklahoma, had this to say on social media about footwashing, referring to John 13: “Many say that these commands are outdated—especially footwashing—but they are of utmost importance. Jesus is saying these things are done to show our love for each other. And in Verse 35, Jesus says, ‘Your love for one another will prove to the world that you are my disciples.’ Bread and wine, towel and basin. Jesus tied both together, worship and service, receiving and giving.” Numerous Church of God congregations like Faith Community follow Jesus’ example of footwashing on Maundy Thursday. Of course, the community Easter egg hunt will also never go out of style. New Albany First Church of God in New Albany, Indiana, is one of countless Church of God congregations hosting an Easter egg hunt for the community. Theirs will take place on the day before Easter, and also include other festival activities: games, food, a bounce house, face painting, a fire truck, and a drawing for a free Amazon Fire Stick and Kindle Fire. As they promote the event to their neighbors, they look forward to the chance to love their neighbors and plant seeds of gospel. Cornwall Church’s new campus in Skagit Valley, Washington, brought both light and color to their community this week leading up to Easter. 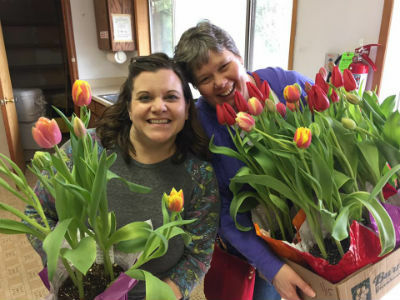 To spread the word about the new church and encourage their new neighbors to come and hear the real meaning of Easter, they delivered tulips to some ninety homes this week. “God is on the move,” they boldly proclaim, in both Skagit Valley and Bellingham. Photo: New Covenant Church of Philadelphia, always ready to serve. New Covenant Church in Philadelphia, on the other hand is already engaged in the Easter observance, but through slightly more uncommon ways. Though the sharing of meals and food distribution are often associated with Thanksgiving and Christmas, New Covenant is serving as one of the host sites for Easter Outreach of Philadelphia, which began several years ago with the simple goal of feeding some of the city’s hungriest families. Local believers were stunned when they heard that a particular ZIP code on the north side of Philadelphia had been named one of the hungriest ZIP codes in the country. Now churches from all over the area participate in an effort to pack five thousand meals by Easter. 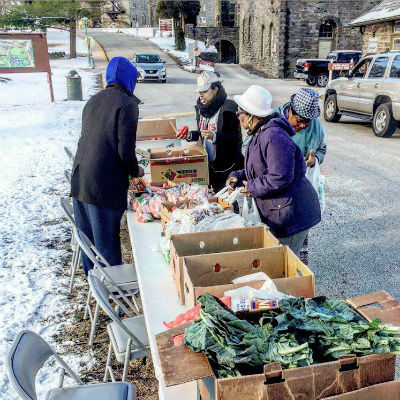 It was a no-brainer for the Philadelphia congregation, already oriented toward community service in the name of Christ. What is your church doing to celebrate Easter? Leave a comment on this article’s Facebook or Twitter post, or send an e-mail to chognews@chog.org. We’d love to rejoice with what God is doing in your community! Happy Easter! REMINDER: The offices of Church of God Ministries will be closed on Friday, April 14, in observance of Good Friday. Learn more about the Church of God at www.JesusIsTheSubject.org. This entry was posted in All Church of God and tagged Bellingham, Communion, community, Cornwall Church, Easter, Easter egg hunt, food distribution, footwashing, Good Friday, Holy Saturday, Holy Week, hunger, IN, Indiana, Maundy Thursday, New Albany, New Albany First Church of God, New Covenant Church, OK, Oklahoma, outreach, PA, packing meals, Passion Week, Pennsylvania, Philadelphia, resurrection, service, Shawnee, Skagit Valley, Sunday, WA, Washington. Bookmark the permalink.